Helpers for state management, streams and BLoC pattern, SharedPreferences and various widgets (animations, blur, transitions, timed widgets, scrollingtext, etc.). Breaking change: it is now mandatory to import the file frideos_core/frideos_core.dart to use the StreamedObjects of the frideos_core package. A light version of this package without dependencies other than the frideos_core package, has been released as frideos_light. A simple trivia game built with Flutter and this package. An implementation of the Todo App of the Flutter Architecture Samples repository using this package. An example app to show how to use some features of this library. A simple starter app with a drawer, app state management, dynamic theme changer and persistent theme using the sharedpreferences. A simple app using the BLoC pattern showing a counter implemented with this library. An example of a medical app built with Flutter for the classification of the arterial blood pressure. A simple pair game (multiple selections, animations, tunnel pattern). By extending the AppStateModel interface it is possible to create a class to drive the AppStateProvider in order to provide the data to the widgets. ValueBuilder extends the [StreamBuilder] widget providing some callbacks to handle the state of the stream and returning a [Container] if noDataChild is not provided, in order to avoid checking snapshot.hasData. N.B. To use when there is no need to receive a null value. It takes as a streamed parameter an object implementing the [StreamedObject] interface and triggers the rebuild of the widget whenever the stream emits a new event. If no [noDataChild] widget or [onNoData] callback is provided then a [Container] is returned. If no [errorChild] widget or no [onError] callback is provided then a [Container] is returned. N.B. The callbacks are executed only if their respective child is not provided. StreamedWidget extends the [StreamBuilder] widget providing some callbacks to handle the state of the stream and returning a [Container] if noDataChild is not provided, in order to avoid checking snapshot.hasData. It takes as a stream parameter a [Stream] and triggers the rebuild of the widget whenever the stream emits a new event. Used with a StreamedValue when the type is a widget to directly stream a widget to the view. Under the hood a StreamedWidget handles the stream and shows the widget. FuturedWidget is a wrapper for the [FutureBuilder] widget. It provides some callbacks to handle the state of the future and returning a [Container] if onWaitingChild is not provided, in order to avoid checking snapshot.hasData. If no [onWaitingChild] widget or [onWaiting] callback is provided then a [Container] is returned. A complex class to hadle the rendering of widgets over the time. It takes a collection of "Stages" and triggers the visualization of the widgets at a given time (relative o absolute timing). For example to make a demostration on how to use an application, showing the widgets and pages along with explanations. Here the map is in the view and is set in the BLoC class by the setStagesMap. // or by the setStagesMap method like in this case. // To show the current widget on the view using the ReceiverWidget. // As an alternative it can be used the StreamedWidget/StreamBuilder. Linear cross fading transition between two widgets, it can be used with the StagedObject. Cross fading transition between two widgets. 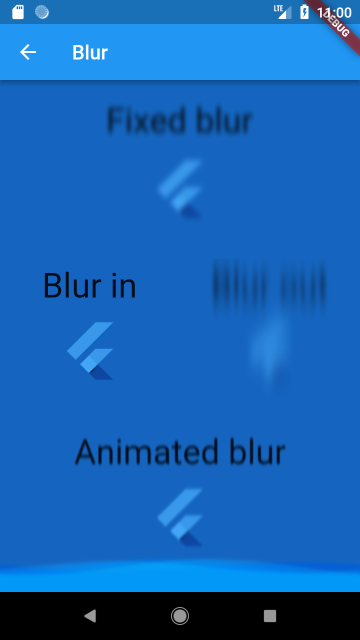 This uses the Flutter way to make an animation. Update README.md: added a new example. Bugfix to the LinearTransition widget. Breaking change: integrated the frideos_core package. It now mandatory to import the file frideos_core/frideos_core.dart to use the StreamedObjects. Update the README.md: added a new example app (a Todo app). Package refactoring: in the example folder there is now a simple example of a counter implemented with this library (the previous examples in this repository). Breaking change: the name of the parameter stream of the ValueBuilder widget was changed to streamed to highlight this is intended to use with the classes that implement the StreamedObject interface. added AnimatedType enum, to handle the behavior of the animated object. added startAnimation method: it is now possible specify a type of behavior (increment or decrement the value), the velocity, a minValue (in case of decrement) and a maxValue (increment). added outStream getter (deprecated: animationStream). Due to various changes in the code this version could cause issues on apps based on a previous version. Now, all the StreamedObjects need to have passed their value to the initialData parameter of the StreamBuilder/StreamedWidget (e.g. using the getter value of the StreamedObjects). As an alternative, they can be used with the new ValueBuilder widget, it extends the StreamBuilder class and get the value from the StreamedObject to pass to the initialData parameter. Simple state provider that extends a StatefulWidget and use an InheritedWidget to share the state with the widgets on the tree. Used along with streams, it is possibile for the widgets the access this data to modify it and propagates the changes on the entire widgets tree. Similar to the StreamedWidget, it extends the StreamBuilder class but takes as a stream parameter an object that implements the StreamedObject interface. - Added the onChange method. It calls a function every time the stream updates. StreamedList and StreamedMap by default aren't initialiazed (to avoid that when using them along with a StreamBuilder/StreamedWidget the snaphost.hasData is true from the beginning,becoming harder to show for example a loading spinner without using a workaround). Added initialData parameter to the constructor to all the streamed classes to initialize the stream with an initial data. - Changed console messages behavior and added debugMode method. By default, the debug console messages on disposing of streams are now disabled. Use this method to reenable this behavior. Helpers for state management, streams and BLoC pattern, SharedPreferences and various widgets (animations, blur, transitions, timed widgets etc. ).